Touch Physics, a game from Gamez 4 Touch, is charming, particularly to anyone who’s ever enjoyed creating their own worlds with multicolor crayons. The game presents players with 50 levels, challenging them to use a crayon and their imagination to overcome some pesky physics. 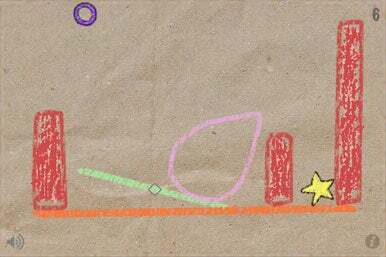 Big Wheel Keeps on Falling: In Touch Physics, you've got to guide a wheel to a yellow star using objects that you draw on the screen. The object of the game is deceptively simple. A small wheel falls from the top of the screen, and you have to guide it to intercept a little yellow star through 50 uniquely designed levels. (A free version of Touch Physics limits you to six levels.) To guide the wheel, you draw objects on the screen with crayons. The objects can be of almost any size and shape, but they’re all affected by the physics of the game. If the wheel falls off the bottom of the screen, the game resets. If you find yourself stuck, a quick shake restarts things at the beginning of the level. Touch Physics provides hours of enjoyment—and potentially a little frustration—as you attempt to solve the most difficult levels. Some of the levels will require you to act fast, while others allow you to plot your path and slowly draw the necessary shapes to get the wheel to the star. While physics is involved, other than shaking your iPhone to reset the level, tilting it from side to side won’t help you coax the wheel as you might like. Also, you’ll quickly learn that drawing objects on top of one another will produce some interesting effects, which,right or not, can help you breeze through some tricky levels. Touch Physics brings crayon sketches to life and provides lots of replay value as you come up with fun an interesting ways of spinning the wheel in the sky. Touch Physics is compatible with any iPhone or iPod touch running the iPhone 2.x software update.